At Stanley Park your ceremony, reception, photos and accommodation can all take place in the one location. You have the flexibility to design your own Wedding Day and the freedom to choose your preferred suppliers. Set in an idyllic and private absolute waterfront location, Stanley Park is the perfect place to celebrate a wedding. 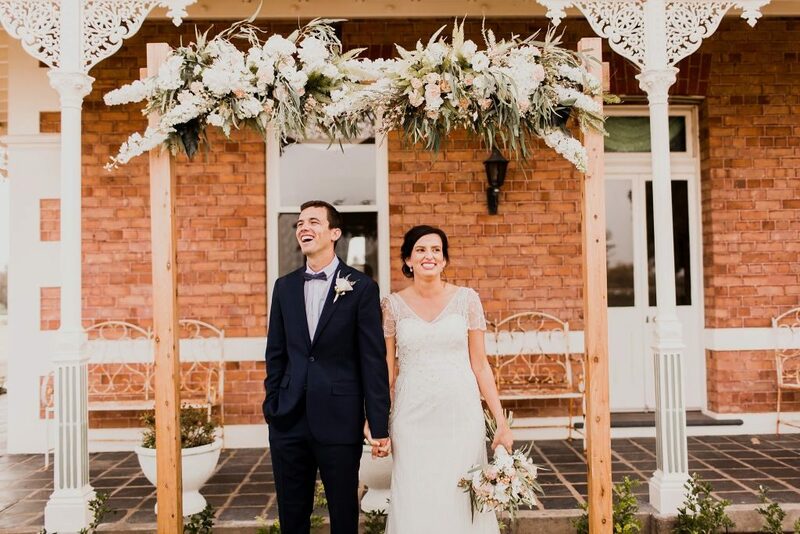 Relax and prepare in the 8 bedroom Victorian homestead, exchange vows under the ancient fig tree, celebrate and dance the night away in the spacious rustic barn, and wind down afterwards back at the homestead. Despite the secluded feeling of being “miles away from anywhere”, Stanley Park is conveniently located just 20 minutes drive from Newcastle CBD, 25 minutes from Nelsons Bay and 5 minutes from Newcastle airport, with additional accommodation options within 5 minutes drive. 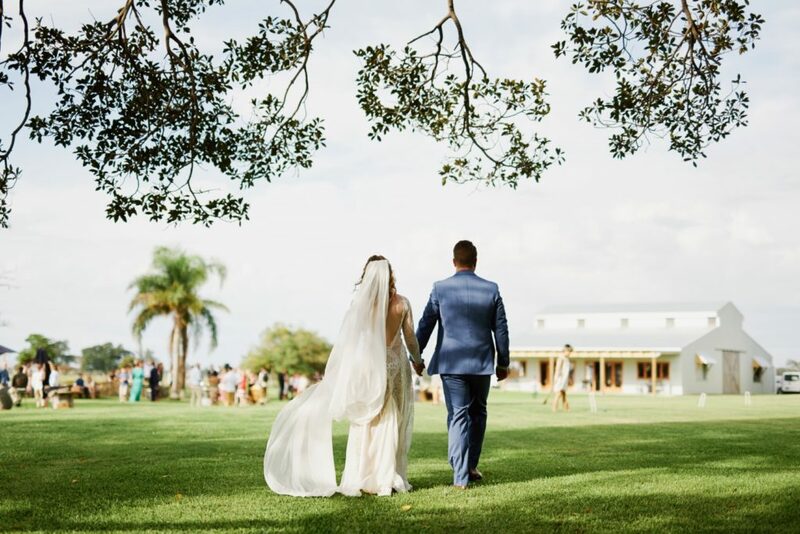 There are several ceremony locations on the property, each with their own beautiful surrounds – whether it be a background of afternoon sun glistening on water, a stunning Victorian architectural setting, a towering old fig tree or a rustic barn setting. 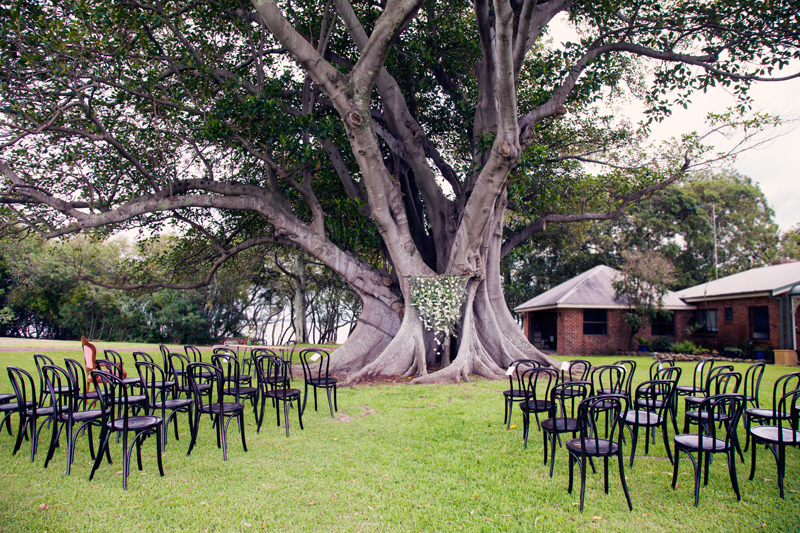 The most popular ceremony location is beneath our graceful giant of a fig tree beside the homestead. 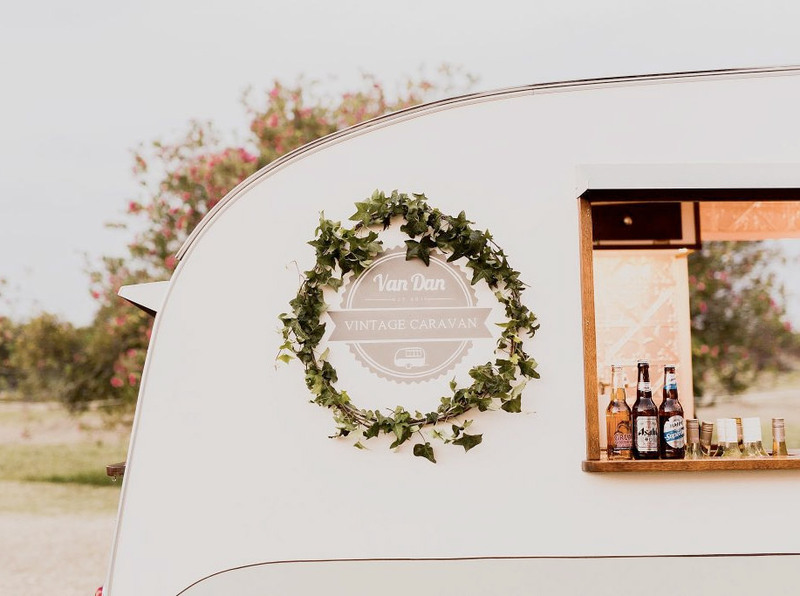 It provides a leafy green backdrop for exchanging vows and plenty of shade for your guests. 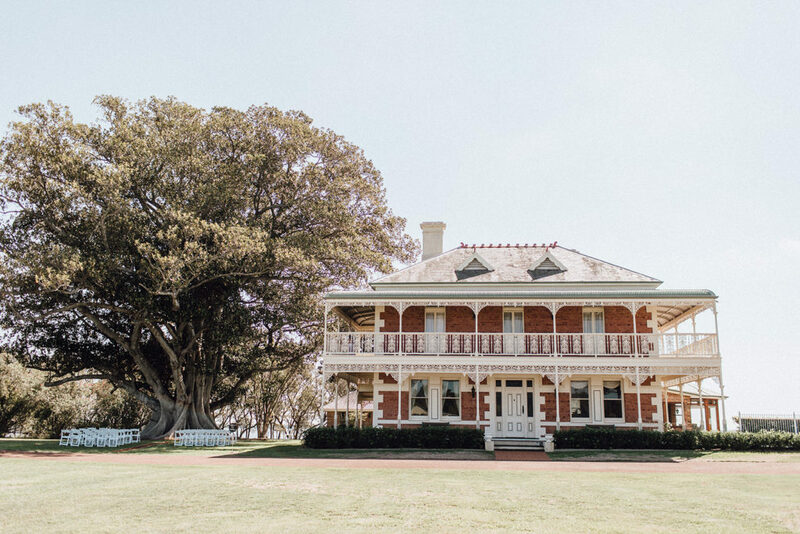 Other locations include the manicured lawns on the water’s edge, the front veranda of the homestead elegantly framed with iron lacework, and the hedged courtyard beside the homestead. The Barn is our wet weather option. 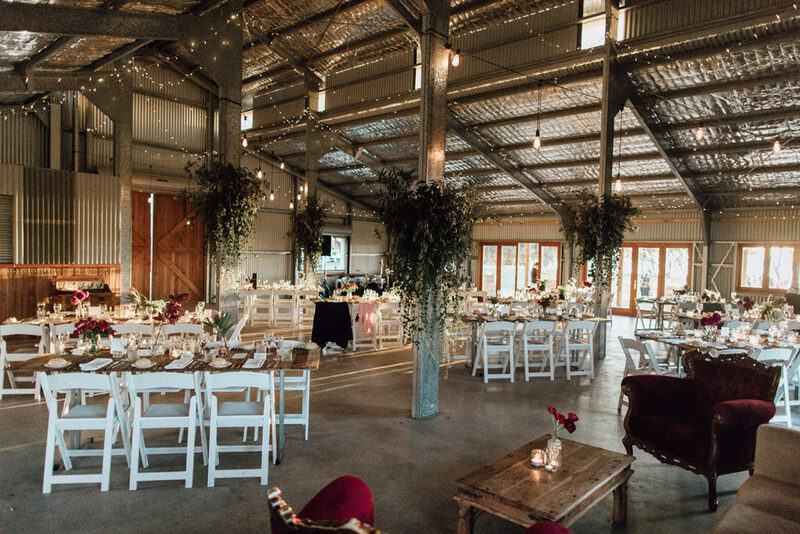 It has a covered terrace that will provide shelter from rain, or the Barn interior can be rearranged for a ceremony setup. Our recently completed American style Barn is a great Reception space. Solidly built out of corrugated iron, steel and timber, it is generously proportioned with a 19 X 16 metre floor space plus an additional 19 X 4 metre covered outdoor terrace, and a ceiling that peaks at 8 metres. It comfortably seats up to 130 guests with enough room for a dance floor. You may choose your own caterer, and we can recommend caterers who work at Stanley Park regularly due to their amazing food and reasonable prices, see the Suppliers list below for our suggestions. 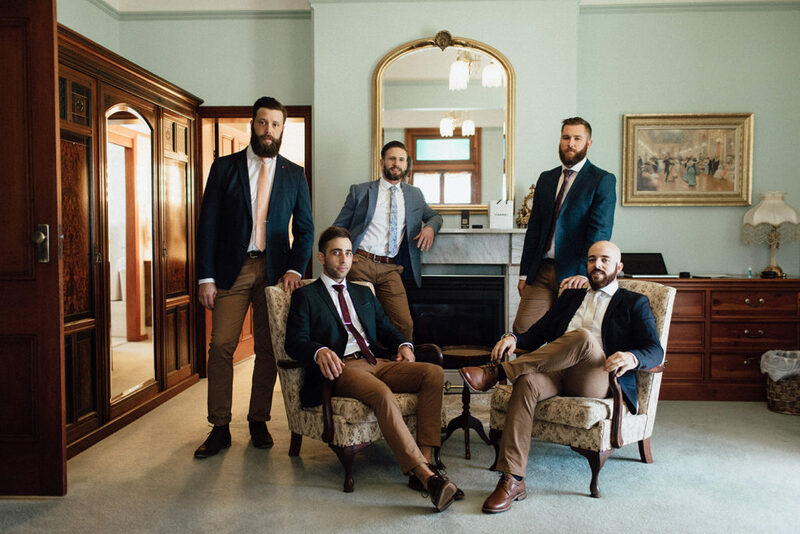 The Barn suits all styles of weddings from glamorous Gatsby to elegant vintage, minimalist industrial and Lux Boho. 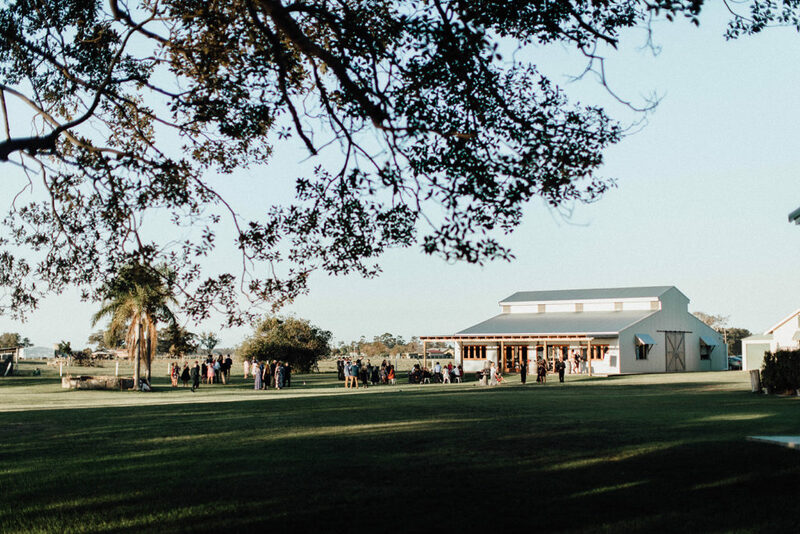 Timber and glass doors across the front of the barn allow guests to enjoy tranquil views of Fullerton Cove, stunning sunsets, and lush green lawns surrounding the barn. Indoor lighting is ambient and adequate, with fairy lights covering the ceiling and drop Edison globes suspended throughout. Lanterns hang from hooks on chains suspended from the 8 metre ceiling, and these can be swapped for anything you or your designer might like to hang, eg chandeliers, candelabras, greenery. The terrace outside the barn is lit with fairy lights and festoons, which throw a nice light across the lawn in the evening. For Winter weddings our Chiminee fireplace will keep your guests warm and create a cosy atmosphere. Drinks are BYO and must be served by RSA certified bar staff who are not wedding guests, for the entire duration of the function. The Bar will close at or before 11pm and the property will close at or before midnight. See the Suppliers section below for RSA staff and drinks van vendors. 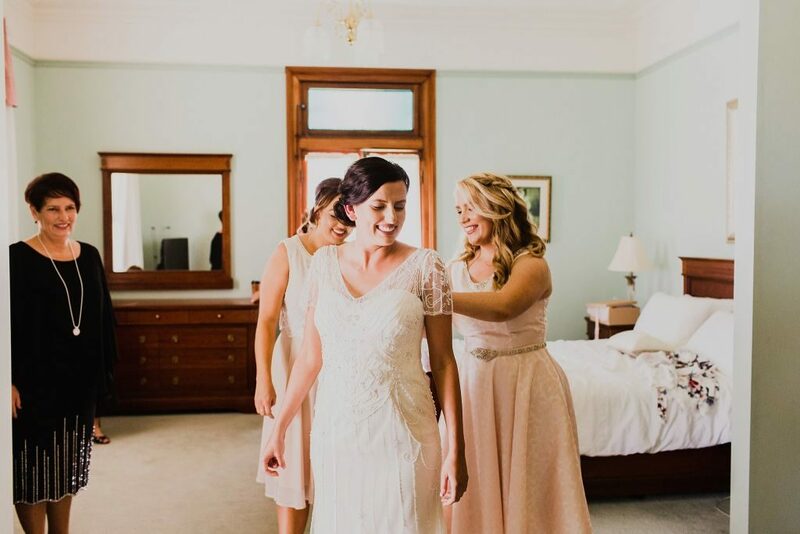 The three level Victorian homestead accommodates up to 15 guests and is a wonderful place to prepare for your wedding day and accommodate your bridal party and family. The historic section of the house features 12 ft high pressed metal ceilings throughout, a beautiful formal dining room (just for photos) and spacious sitting room with grand piano. The newer section of the house contains a fully equipped kitchen and a spacious open plan dining and entertaining area with a pool table and conservatory overlooking the Cove. Click here for a gallery of accommodation images. Homestead weddings for up to 30 guests including bridal party – price on application. To confirm a booking the deposit is $1000. The balance is required 4 weeks prior to your wedding, or self nominated progress payments can be made. A security deposit (bond) will apply to all bookings. Here are some answers to frequently asked questions ..
You can Bring Your Own drinks. (They must be served by RSA qualified staff who are not wedding guests, for the entire function. Bar and music will close at 11 for 12 midnight venue close. There is plenty of guest parking in close proximity to the barn. There will be a manager onsite for the entire duration of the wedding. 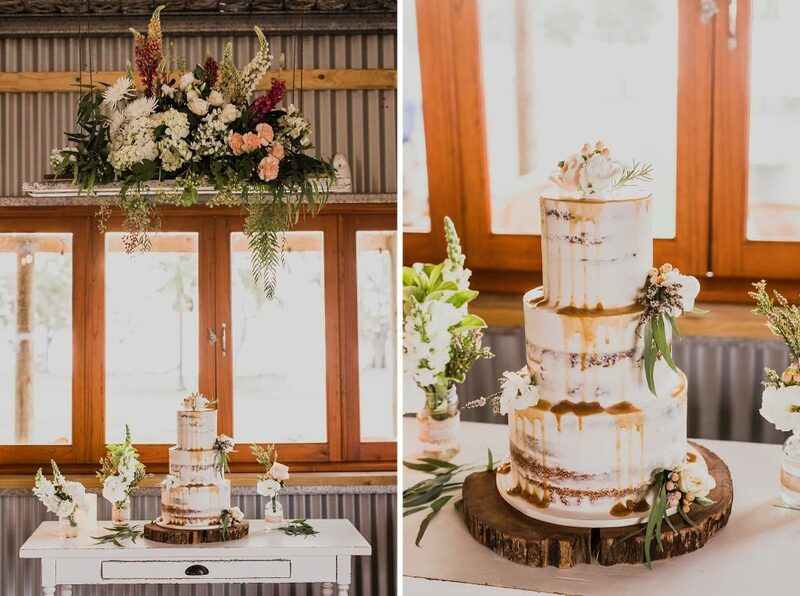 There is a catering space in the barn – it has stainless steel benches and sinks. Caterers will bring/hire cooking equipment. There is a large cool room for drinks and for caterer useage. Your Pets can attend the ceremony only and must be taken home straight after the ceremony. Clean up – there is a large skip bin on site for rubbish. Supplier Deliveries such as decorating items, furniture, drinks etc, can arrive the day before the wedding. The Barn can be set up on the day before the wedding from 10-4pm and suppliers can pick up items on Monday. If the homestead is to be used for accommodation for the wedding night only, early morning access is allowed on the day of the wedding.